KSOP is supporting the new Physics Laboratory for Pupils that has been opened by the Department of Physics in July 2009. The setting up of the lab was supervised and supported by Prof. Dr. Kurt Busch and Prof. Dr. Heinz Kalt, both KSOP principal investigators, as well as Prof. Dr. Günter Quast. The physics lab gives pupils the opportunity for direct contact with scientists and illustrates the significance of research. 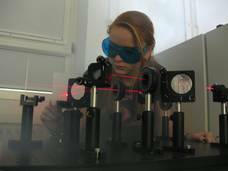 It includes various experiments from the field of optics and photonics such as optical tweezers, nitrogen laser, microstructuring, and spectrometer.